I have made this dish so many different ways and so many times that my efforts have definitely taken years off my life. I guess I would rather live fast, hard, and happy then long, dull, and….skinny. I made this one for some friends to celebrate his birthday, as a side dish with a “Tomahawk Chop”. Here is the recipe, I think it is a winner. I am curious to hear your thoughts on this recipe. Pay particular attention to the details because that is the most important part. Remember, if you are going to clog your arteries do it in a way that makes you smile. 2 oz. of Tillamook extra sharp cheddar cheese, grated. Pre heat the oven to 400 degrees, lay your bread crumbs on a cookie sheet and toast bread for five minutes, until golden brown. 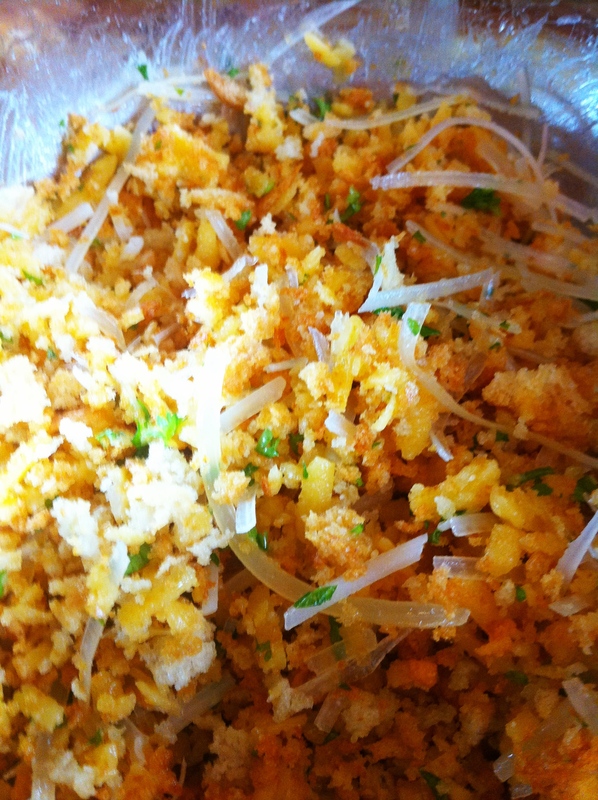 Remove let cool, then toss with a fork the remainder of the ingredients. The topping is tasty, I wanted to use it for some veal parmesan. 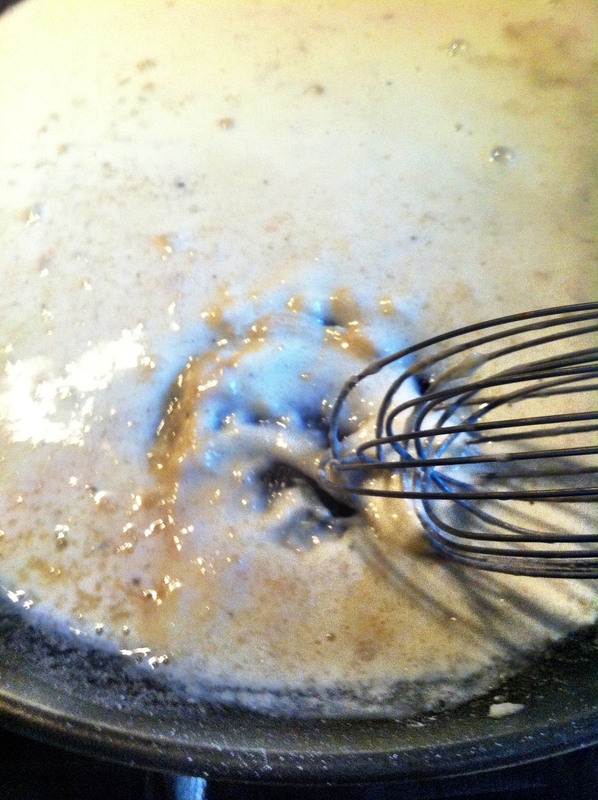 Melt the butter in a saucepan over med low heat and whisk in the flour. This called roux. Whisk for about 3 minutes, then slowly whisk in the milk. Bring sauce to boil, whisking constantly, then simmer the sauce while whisking occasionally for three minutes. Whisk in heavy creme, mustard, Worcestershire, cheeses, teaspoon of salt, and pepper to your liking and remove from heat, cover the sauce pan. 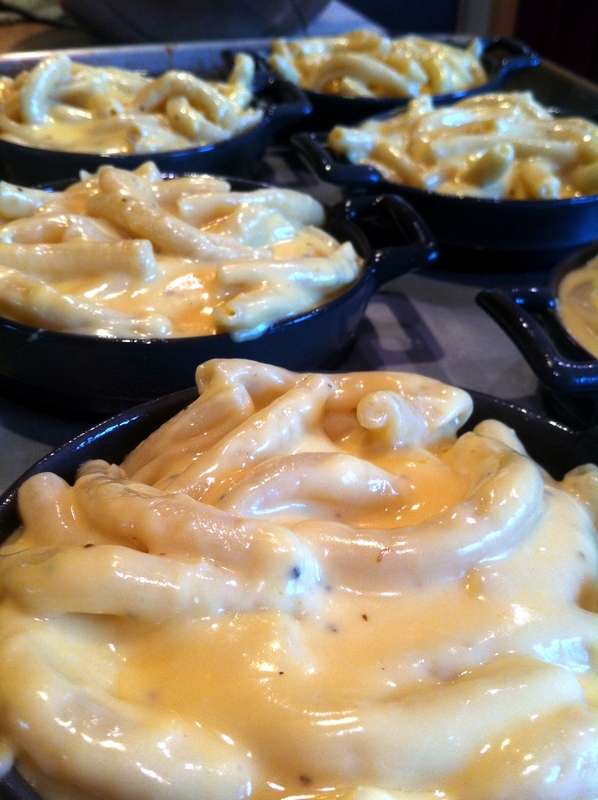 Once the macaroni is finished drain and toss in a bowl with the creme sauce, then pour pasta into your baking cook wear. 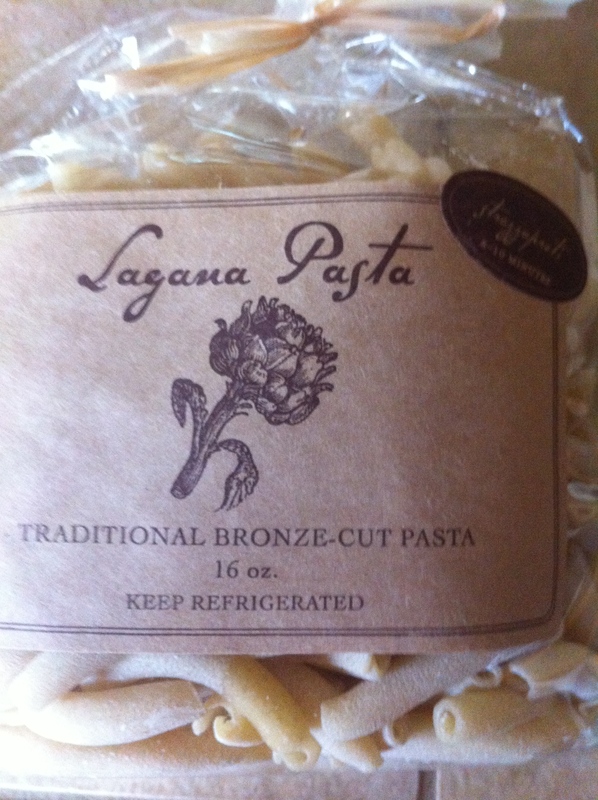 Pour the mixed pasta into your baking dishes. 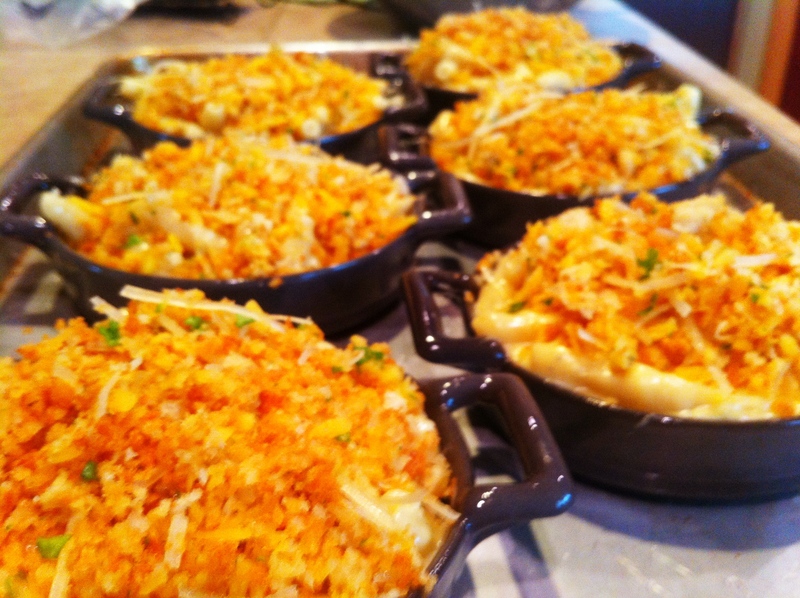 Then you take the topping you previously made and begin topping the macaroni. Bake in oven until golden brown and bubbling for 20-25 minutes. I hope you enjoy it, it is the bomb! 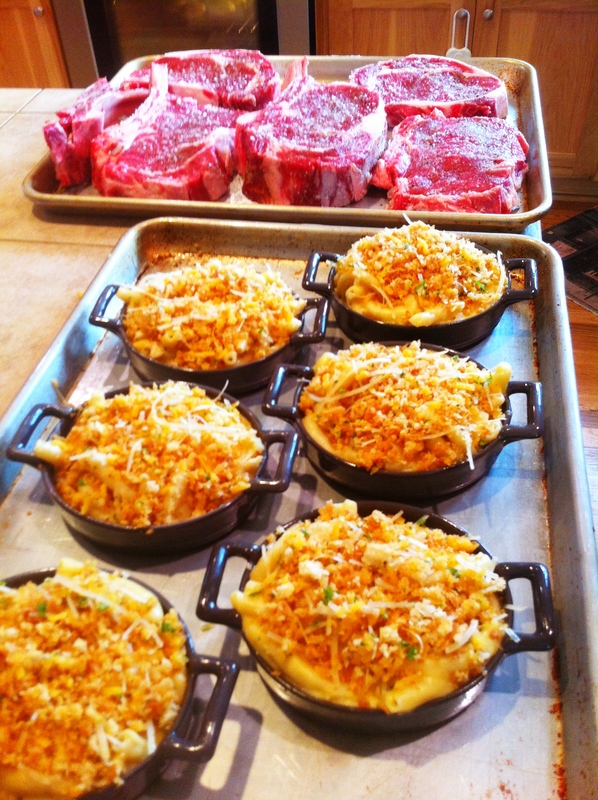 Your mac looks awesome (and so do those steaks behind it in that one picture). Have you tried baking the mac n cheese in your Egg? You know I was going to do it that night, because I think it would have been a great flavor with a crispy top for texture. However, I did not have the grill space…as you can see by the size of those 3 lb steaks. I will give it a try though.